"Great directions. easy to follow." 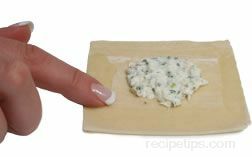 Whether you are preparing crab rangoons, potstickers or wontons, wrapping them easily can be a little intimidating. Consider the following as a way to wrap like a professional. 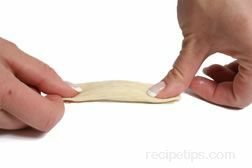 Working with prepared, packaged wonton skins or wraps is the easiest way to get started. They can be purchased in most grocery stores. 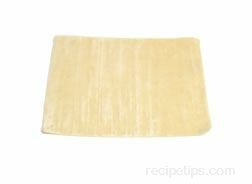 Place the wonton wrap on a flat working surface. You can work with one at a time or create an assembly line. Either way is fine. Keep wrappers that are not being used in an air tight package since they dry out quickly. Place a small dollop of the desired filling onto the center of the wrapper. Be careful not to over fill it to prevent them from bursting when they are frying. Spread the filling out to the size of a quarter. 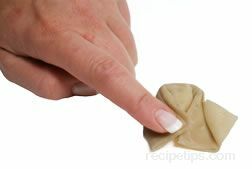 Use your finger or small pastry brush to moisten the edges of the wrapper with water or egg wash. 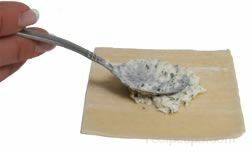 This will act as the glue to keep the wonton wrap held together when folding. Once the edges have been moistened, fold the wrapper in half to create a rectangular shape. 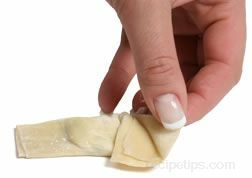 Press around the outer edges to make sure that the wonton has sealed. It is also important to press out any air that might be trapped around the filling. Too much air inside the wrapper will result in the wonton puffing up and breaking open when frying. Moisten the sides again with water and fold the wrapper in half one more time so the wrapper is a quarter of the size that it was originally. Press the sides down for a tight seal. The wrapper will now have a creased side along the long edge and an open side. Turn the wrapper so that the open edge is pointed up. 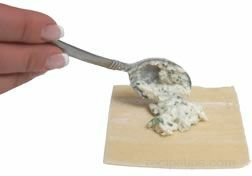 Take the right side of the wrapper and fold it down over the right edge of the filling. There should be four layers on the right hand folded side of the wrapper. Grasp the top layer and pull it up so that it sticks out slightly. Fold the left side of the wrapper down as you did to the right side but this time overlap the right side a little. Moisten in-between these two layers and press to seal. Grasp the top layer on the right hand side and pull it up so that it sticks out. The end result should look somewhat like a nurse's hat. The wonton is now ready to boil, steam, or fry. 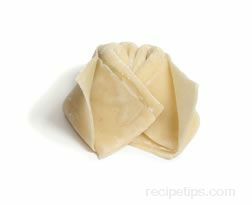 Tip: As the wontons are being prepared, keep those that are finished under a slightly damp towel so that they don't dry out.